Last week I gave you the “week night” meals to make from a whole chicken. There’s two more meals we made from that bird, about a six-pounder, but I’m telling you now, this is weekend cooking. Both of these things take most of a day to make, but they’re totally worth it. To me, few things feel like home like the smell of a kettle of something on the soup, and making chicken and dumplings from scratch is one of those kettles toward the top of the list. In the last post I mentioned putting the carcass in the freezer, and for good reason: we can’t let the last of the bird go bad while we’re cooking off the carved parts. So I pulled the chicksicle out of the ice box, and put it straight into the biggest pot I have. I added enough water to cover it by an inch, about three to four quarts, added salt and pepper to taste. With the lid firmly in place, and brought that water to a boil. I let it boil for at least three hours. This rendered the fat from the chicken, and loosened a lot of meat from the bones, giving us a wonderful stock. After three hours, I fished what I could of the carcass out of the pot and onto a large plate, letting it cool. Set on the counter a large bowl (or another big pot, if that’s what you have) with a strainer over the top, and pour your stock through the strainer. This helps to sift out as many tiny bones as possible. From the strainer, put all the safe meat back in the bowl, and pour all that back into the pot. By now the carcass should be at least touchably cool, in which case you’re going to separate the last of the meat from the bones, returning it to the pot. You’re now ready to start chicken and dumplings. 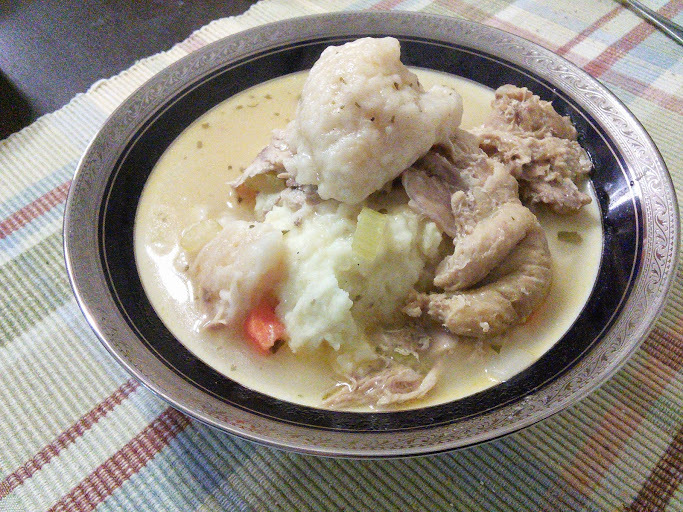 There are few things more down home than chicken and dumplings. Now the the chicken stock is made, it’s time to get things rolling. Dice and smash all your veggies, and throw them into the pot, along with the herbs. Cover, then bring to a boil, then bring it down to a simmer, adding water if you lose too much to evaporation. I usually simmer about an hour, longer if I started too early in the afternoon. When you have about twenty minutes left on the simmer, in a medium-sized mixing bowl, whisk together the flour, baking powder, and salt. Cut in your shortening, until the mixture is coarse, with pea-sized lumps. Stir in the milk. Now, this is my Great-Grandma’s recipe, and I know she’d never steer me wrong (she hasn’t yet) but this one tells me to roll and cut out my dumplings. Sorry Grandma, wherever you are, but I save that move for the biscuits. With the dough firmly combined but not overworked, I pull a soup spoon out of my silverware drawer, and drop spoonfuls into the simmering liquid. Let cook for ten minutes, then serve. Now, the next thing I’m gonna tell you about is going to make you uncomfortable. It’s delicious, but the name will make you squirm. That’s OK, I just ask you to keep an open mind here. 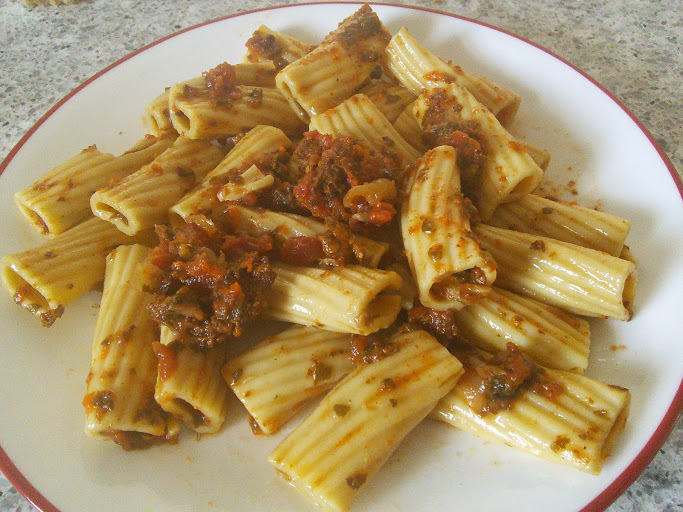 Rigatoni with giblet sauce – made you gag a little, didn’t it? I got that reaction a lot when I expressed my excitement over it. I like the idea of using a new ingredient, and where it comes from on an animal doesn’t usually phase me. We eat sheep intestines when we eat sausage, and nobody thinks twice about it. I say use chicken guts, everyone throws up in their mouths a little. But I’ll tell you what about this recipe, when you eat it, you would never know there were giblets in it if you weren’t told they were there. I found this recipe on foodnetwork.com, and while I made a half recipe for the sauce, I went overboard and ended up making a whole pound of pasta, and there wasn’t a lack of sauce whatsoever. The recipes calls for a can of whole tomatoes, but you’re going to promptly crush them, so I’m telling you to cut to the chase. I’m a little cheap, so I swapped out the pancetta for bacon. The original also says it makes six servings, but I know it makes more than that. In a large pot over medium heat, cook the bacon until slightly crisp, about 5 minutes. Meanwhile, rinse the giblets and slice into 1/2-inch pieces. Add the giblets and neck to the pot, cook until browned, about 5 minutes. Add the onion and red pepper flakes, cook until the onion is soft, about three minutes. Stir in the tomato paste, garlic, bay leaves, rosemary, and 1 tsp. salt, cooking 5 more minutes. Add the wine and cook until slightly reduced, about five minutes. Add the can of tomatoes, 3 Cups of water and the Parmesan rind. Increase heat and boil 5 minutes. Stir, reduce heat to low, partially cover and simmer until meat is falling off the neck bone, about 4-5 hours. Remove the neck, pull the meat off the bone, shred, and return meat to the sauce. Remove the bay leaves, add the parsley. Taste and add salt and pepper accordingly. Bring a pot of salted water to a boil, and cook pasta according to the package. Drain and toss with the sauce, top with shaved Parmesan. Tip of the week: Adding parmesan rind to your tomato sauces add a delightful depth of flavor, adding nutty notes to a sweet, herbaceous sauce. ← Governor Larry Hogan’s era of good feeling: Will it survive?